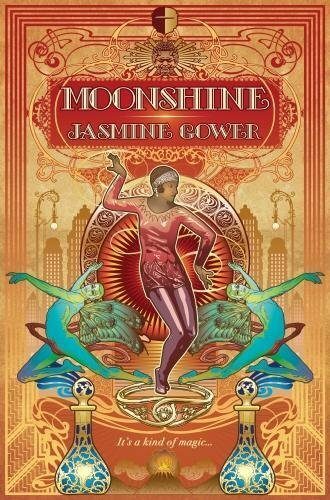 Moonshine, Jasmine Gower’s debut novel, did not sweep me away. It did not quite succeed in capturing me and drawing me into the inner and outer world of its characters. Still, it is a likeable story that cleverly and thoughtfully widens the possibility space for what the fantasy genre can do, and how it can do it. The setting is a fantasy-world version of our world’s 1920s. The beginning of the novel finds Daisy Dell, a young black woman committed to the lifestyle of the Modern Girl, enjoying a night on the town, celebrating her new job as a typist. Her new boss, Andre Swarz, really does need a typist, due to a childhood accident. In that much, he has represented himself honestly. His business, however, is not a “document management company,” as he has claimed. Andre, in fact, manufactures bootleg mana, a necessity for any methodical magician who wants to replenish their body and their strength after a spell (and for any non-magician who wants a meth-like buzz). Daisy herself practices a different kind of magic, one that does not physically deplete her, but still comes with a price. Through a series of misfortunes, Daisy and her new colleagues end up facing off against the sympathetically rendered hitwoman Ming Wei, who has been hired by politicians hoping to use the murder of a magician to further their ambitions. The story introduces a likeable cast of characters, most of whom are non-normative in terms of either gender presentation or attraction. Gower makes this look easy when the long calcification of our vocabulary has made it anything but. And this diversity allows for characters to relate to each other in ways that break familiar cliches as neatly as if they were sticks snapped over Gower’s knee. For instance, although at times Daisy and Andre’s conflicts with each other evoke Elizabeth and Darcy’s in Pride and Prejudice, Gower subverts this arc in a way that I found not only surprising but also touching. Andre is not interested in romance, but that does not mean that the sexual relationship that he ends up falling into (with a male fairy, rather than Daisy) is not emotionally significant to him. This plotline is among the most effective in the novel. Gower is thoughtful about finding ways to establish the meaning of this encounter, to make it something that endearingly rounds out Andre’s character and his role in the story. Most Ashlanders spoke the Iongathi Trade Language—not because there were many Iongathi immigrants in Ashland, but simply because it was so common in international trade—but this young man kept stumbling into some kind of Algretau-Glynland pidgin. The bronze-skinned women in beaded Awros-style veils snickered at his patchwork language, whispering between themselves about his stilted efforts to communicate. Familiar as some aspects of the worldbuilding and story might be, this is not the world we know. The story takes place in the country (not the city) of Ashland, which had long been uninhabitable to humans due to volcanic activity. Silver ash still falls regularly over the city. Most residents of Ashland are at most third generation. Daisy must deal with the legacy of her grandmother, who had to make brutal decisions to survive in a largely lawless land. This commitment to a secondary world setting allows for some very positive effects. For one, it allows Gower to build a world with less sexism, less sexual repression, less transphobia, and less racism than our own. Her approach to this worldbuilding results in a disorienting sense of how to “read” people. We are pleasantly at sea regarding race and ethnicity in a world that is in so many ways so close to our own. This approach to worldbuilding also gives her more room to create her own unique world, with less justification required to make us believe in magic. Magic was more practical as a utility than a weapon, she had always thought. She never understood why the mundanes feared it and its wielders as much as they did. In a place called Soot City, in the nation of Ashland, it was a wonder that they didn’t practically worship magicians for their potential to manage the volcanic weather. Granted, the volcanoes had been tame for centuries now, and the ashfall was no longer uninhabitable—that would rather complicate the presence of a city there, of course—or even unbearable. Some days it was just worse off than others, same as weather anywhere else. The shape of this thought doesn’t put us inside Daisy’s head, thinking and feeling with her. “Didn’t practically worship magicians” doesn’t feel like it belongs to her as a phrase; it does not let us get to know the cadence of her thinking. And since Daisy hasn’t been “anywhere else” this way of framing the thought feels strange, in this close third-person point of view. Indeed, it often felt like the way characters thought and felt was overly determined by what would generally make sense now rather than what would make sense in the world of the story. Daisy demonstrates to Andre that she can use a magazine cover to perform cultural analysis of her world, reading the place of fairies within it based on how the fairy has been depicted. Although there is much to like in this moment in terms of character development, this type of thinking to me feels so specific to our current cultural conditions that it takes me out of the fantasy. I’d prefer to have seen Daisy thinking along lines that seemed more particular to her own world. There were moments where the characters’ thoughts and behaviors did diverge from what I would expect, but there too I had only an abstract understanding of the characters’ emotions and thought processes on these matters and was therefore not quite able to accept them. When Daisy tells us that “Ogre” is an offensive term, but never takes steps to learn the correct one, I do not understand why. Most of the major developments in the plot occurred due to chance happenings. Both the “heroes” and the “villains” lack a grand plan, and stumble through the plot, making the best of it as they go. There are things to like about this: it humanizes both the protagonists and the antagonists and avoids becoming a story where everyone is implausibly masterful and knowing. It also, however, means the story is not driven forward by Daisy’s own desires and hopes—a structure that is generally less compelling. The violence in the story also often took me by surprise in terms of its severity, and in terms of Gower’s willingness to allow it to cast a shadow over sympathetic characters. An otherwise likeable colleague of Daisy’s tortures an ex-mobster for information. It is done to protect her and her friends, but it is an ugly act, and Gower shows us how badly it has affected the woman she chose to torture. Gower makes it clear that this unlucky woman, who simply happened to seem like she might have information, will be paying off the hospital bill for years. Although Gower’s willingness both to let “good” characters (particularly women, who often don’t get this type of complexity) be violent and to consider the effects of this violence sets this story apart, it sat awkwardly alongside the story of this tight-knit, personable “found family.” I think this treatment of violence would have worked better in a longer, more diffuse story with more characters, a fuller gamut of emotional situations, and a more explicit and sustained attempt to address this tension. Still, I appreciate that Gower pushes her narrative in surprising and thoughtful directions, even where the effort is not perfectly polished. I’d take this over another Game of Thrones any day.